Lost and found items were collected throughout race weekend at the Abbott Health & Fitness Expo and in Grant Park on race day. If you are looking for an item that was lost, please visit the Bank of America Chicago Marathon Crowdfind page to confirm if your item was turned into the event lost and found. As soon as you cross the finish line, celebrate your accomplishment at the Biofreeze 27th Mile Post-Race Party in Butler Field, near the start line at Columbus Drive and Jackson Drive. The outdoor celebration will feature live music, food and beverages available for purchase. Participants age 21 and over (photo ID required) can redeem the tear-off portion of their bib number for one free Goose Island beer. 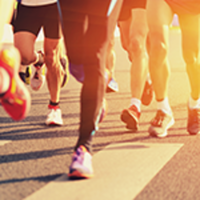 More than 200 students, faculty, and alumni from Chicago’s Cortiva Institute will offer complimentary post-race massage treatments for runners. The Massage Tent will be located within the Biofreeze 27th Mile Post-Race Party at the southwest corner, adjacent to the Petrillo Band Shell. Participants and spectators can view finisher results at the Race Day Runner Results Tent within the Biofreeze 27th Mile Post-Race Party. Volunteers will be on hand to help you look up unofficial race day results.